Go-to-Gifts: The Survival Box for Nursing Mamas Mama Say What?! | Mama Say What?! I recently had my second son, K, back in March and am fortunate that we have had a very easy and enjoyable nursing experience (so far!). Minus some seriously painful engorgement the first week, it’s been more or less an excellent bonding experience. I forgot how much I enjoyed breastfeeding! It might sound weird to some, but I really do enjoy those quiet moments where it’s just me and him at 3 a.m. I love being the one that can soothe him when he’s fussy and I love the way he looks at me and smiles with a mouthful of warm milk dripping down his chin. I don’t know why, but I love talking about nursing with other mamas and am eager to help with advice or encouragement if I’m asked. When my good friend found out she was pregnant after struggling for a couple of years, she told me she planned on nursing and I had a unique idea for her baby shower gift. 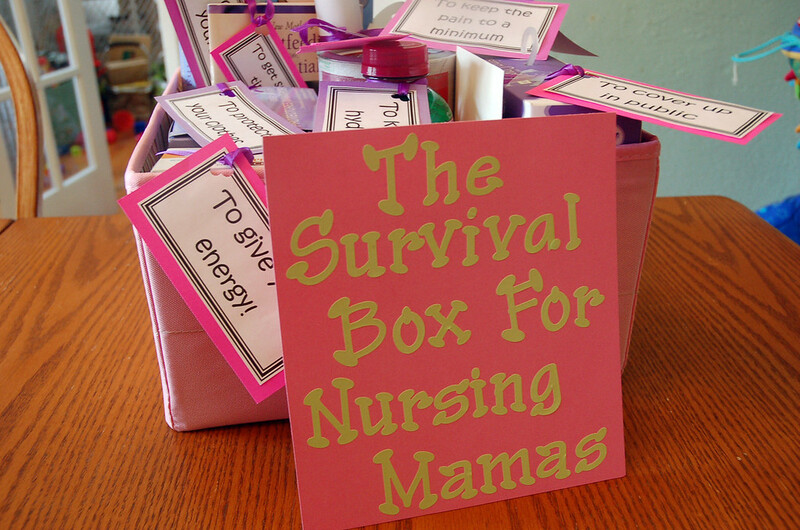 I created “The Survival Box for Nursing Mamas” and it was a hit! Many other women at the shower commented that they loved the idea. Since breastfeeding is something that’s been very special for me, I wanted to do what I could to help the mama-to-be to have a successful breastfeeding relationship with her daughter as well. I included tags on each gift and left it all unwrapped, which I think was appreciated since opening gifts at this shower took almost two hours! I packed everything in a nursery organizer box that was on her registry. I made a sign from cardstock and stickers and wrote a card offering support if she ever needed it. Voila! It was a gift that was fun to put together and definitely will be useful for any mama that plans to breastfeed. 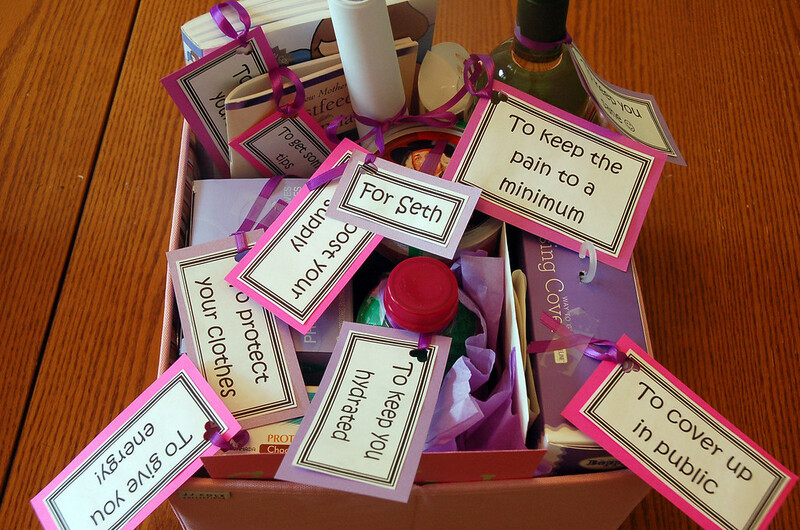 What would you have liked to receive in a nursing survival box at your baby shower? Added by MaryEllen M. on June 13, 2013. Fantastic gift idea. I would have loved this when I had my son. My additions would include a nursing tank top or two and a set of ice packs for my sore nips! A six-pack of my favorite beer would have been nice too. This is such a great, practical gift idea, especially for a first-time-mama who may not have thought to have some of these things on hand. With my first son I experienced a lot of pain the first few weeks and I found the “Soothies” gel pads offered me a little relief! You can put them in the refrigerator and then apply them to your breast for some cooling relief! Also, I liked using a mix of disposable and reusable nursing pads! Also, a nursing pillow like the Boppy would be great (but not fit in the box!) I’ve used my Boppy more than any other item I received! After nursing two kids I can say it has been used daily! Pingback: 21 Unique Baby Gifts (that aren’t clothes!) | Onyx & Blush Co.